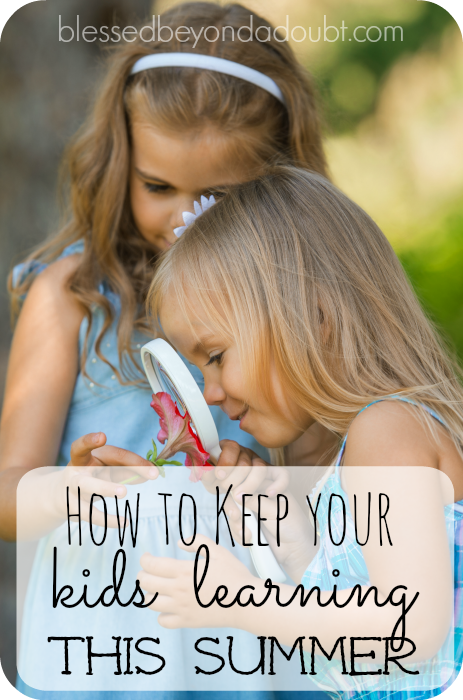 5 Ways to Keep Your Kids Learning Over Summer Vacation! Just because school isn’t in session during the summer doesn’t mean your kids’ brains shouldn’t get any use! Making sure they keep learning ensures an easier time during the next school year. While encouraging learning during the summertime may sound like something difficult, it actually can be pretty fun! Check out these 5 Ways to Keep Your Kids Learning Over Summer Vacation! Obviously vacationing in a historically famous city or spending all day at the museum would be the easiest way to teach your kids things during their summer vacation. But you can also get them to learn in more subtle ways. If you go to the beach, have a quick chat with them about tides or marine life while wandering around looking for shells. When at the park, maybe point out different types of trees, or explain things about the bugs crawling by. With audio, visual, and tactile aids surrounding them, your kids will likely learn from what you say without even knowing it! A great way to keep your kids learning over summer vacation is to do DIY projects together! There are so many projects you could do that would teach them things. You could get a kit to build a simple robot , you could do sewing crafts, simple woodworking , or upcycle something old into something new! Your kids will learn from the DIY experience, and may learn even more as they see their creations being put to use! Just as kids learn from chores, they also can learn by having simple jobs. Maybe your kid’s job could be to start taking care of the dog more. That teaches them about animals and pet ownership. Or maybe they could be responsible for handling the coupons at the grocery store. That teaches them about budgeting and money management. During a vacation or long car drive, they could be responsible for handling the map (or the GPS on the smartphone). That would teach them about geography and wayfinding. These “jobs” will keep your kids learning over summer vacation, and they’ll probably have fun at the same time! Summer time is a great time to do community service as a family! And not only will your time aid your community, but it also can teach your kids so much! Volunteering at an animal shelter teaches them about animals, while volunteering at a soup kitchen teaches them about the less fortunate, empathy, and how to work with a group. So you help your community, and your kids learn some really important concepts. That’s a win-win! To keep your kids learning over summer vacation, get them reading! Free of the restrictions of a curriculum, your kids can explore a large variety of genres and different styles of stories! Try to lead them toward a few books that you know teach important topics. To make their reading experience even more fun and to improve reading comprehension, why not also do activities based on the books? They could draw out scenes, re-write some parts, or even put on a play based on the books! You may even be able to find free printable activities that go along with some of the most popular books! How do you keep your kids learning during the summer? « NO Pain, NO Stress Way to get your Kids to Brush!